2 bedroom bungalow, sleeps 4, with panoramic views and a stroll to the beach. 'Valley View' is a perfect base for a relaxing holiday. Set in a peaceful location, with views across open countryside and the sea. 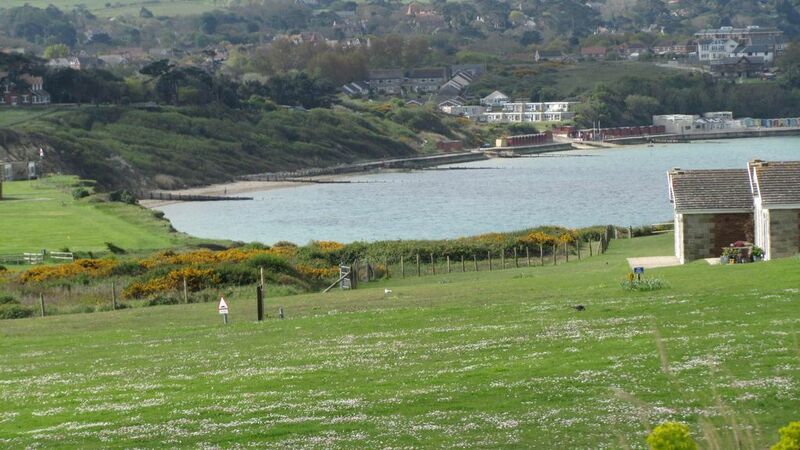 The beach is a few minutes stroll away and access to the coastal footpath leading to Fort Victoria Country Park is also nearby. Short breaks available from £70 per night - please ask for a quote. The bungalow is situated at Linstone Chine in the West Wight, a beautiful area of the Island, with miles of scenic walks and cycle tracks and amazing views from Tennyson Down. The family friendly beach at Colwell Bay is a 15 minute walk away. Newly refurbished, the bungalow is located up on the hillside, a few minutes walk away from the main site at Linstone Chine Holiday Village. It is semi-detached and sleeps 4, with one double bedroom and one twin room (duvets and pillows are supplied but not linen). The main living area is open plan, with a well equipped kitchen having a fridge-freezer, dishwasher and a microwave. The lounge area has a dvd player and mini hifi and a variety of books and games. From 2018 wi-fi is available free of charge for all occupants. The bathroom has a shower over the bath. The bungalow is fully double glazed and heating is provided by thermostatic electric convector heaters. Outside the patio has far reaching views across to Colwell Bay in one direction and distant views of The Solent in the other and there is plenty of parking alongside the bungalow. The site offers a small shop, childrens play area, pitch and putt and crazy golf . There is also a laundrette or laundry service provided by the shop. The property is an ideal base for families or couples to explore the Island. There are several family attractions as well as historic buildings including Carisbrooke Castle or Osborne House. Nearby, there is The Needles Landmark Attraction with open top buses up to The Needles Battery or the chairlift down to Alum Bay renowned for its coloured sands. Also, close by, there is a golf course and riding stables and from Yarmouth, boat and fishing trips can be booked. Freshwater village, within a few minutes drive, has a variety of shops and an indoor heated pool at the sports centre. Came here with my hubby & two young son's. We had a lovely stay in this well equipped bungalow & stayed for a week. Great coastal location with fabulous views all around & walks. Further along is a clubhouse which they allow non members & and a great beach hut restaurant. If you want peace & quiet & a relaxing stay, this is the place. A beautifully modernized two bedroom chalet bungalow with a patio ideal for exploring the West Wight. Only a few minutes walk to a safe bathing bay where we swam, canoed and had beached BBQ's whilst watching the sun set. Next to the Fort Victoria Country Park with woodland trails. A pleasant walk through the woods and along the beach soon takes you to the pretty town of Yarmouth with its castle, shops and harbour. A jet boat ride out to the Needles is a must! Ssssh, don't tell anyone, they will all want to come here! Beautiful week. Loved the views, sunsets, proximity to coast path and being on the quiet side of IOW. Compact but well equipped. Good base. Well equipped property on quiet site and close to beach. Very close to Alum Bay, Yarmouth and Freshwater Bay. 1/2 mile driveway has some large potholes which were irritating to navigate at the beginning and end of each day, but in fairness other reviewers had mentioned this so it wasn't a surprise. Short breaks available from £60 per night - please contact for availability. Arrival is from 3pm and departure 10.00am. The prices include electricity. Hand towels and t-towels provided. Please bring own linen and bath towels - these can be hired if required. A travel cot and high chair can be supplied at no extra cost. 25% deposit required with the balance due 40 days prior to arrival.